This what your SUSTAINABLE LAND USE & IMPACT ASSESSMENT Blog Ad will look like to visitors! Of course you will want to use keywords and ad targeting to get the most out of your ad campaign! So purchase an ad space today before there all gone! Sustainable development is a growing concern expressed by many businesses, organizations and individuals. Yet, no workable quantifiable definition of sustainability is available for evaluation of specific projects or operations. This paper attempts to set a framework for such a definition in terms of the first and second law of thermodynamics. Specifically, the proposed description of sustainability relates the fundamental processes of chemical, physical or biological transformation, and mass transport to energy and entropy changes. Unlike previous applications of these concepts, the proposed definition is focused on the smallest unit operations and processes while allowing for aggregation into larger systems. 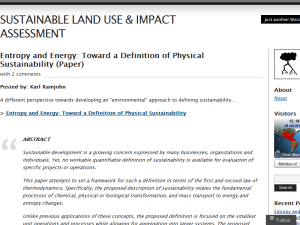 The proposed description also explicitly considers the time horizon for sustainability. An example of sustainability analysis for a water treatment process is included. Slawomir W. Hermanowicz, “Entropy and Energy: Toward a Definition of Physical Sustainability” (December 1, 2005). Water Resources Center Archives. Working Papers. Paper swr_v2. If we define the environment as “the combined features and assets that provide the basis for economic and social development, natural resource management and conservation”, it becomes abundantly clear that, sustainable management strategies, options and “best practices” must be planned, implemented and maintained in the context of the processes, components and attributes of the abiotic, biotic and human factors in any developmental landscape. Following on the earlier posts, this article examines a theoretical approach to management of impacts to the natural biophysical environment, associated with socio-economic development. This requires the establishment of a focus, for the development of a systems methodology based on measurable parameters which can be used to quantify changes in natural resource status, in relation to hypothetical marginal damages resulting from development impacts (industrial and other). · Physical resources of the natural environment potentially affected BY development activities. These are defined by the forcing functions (enduring features and driving variables) of the natural environment, that potentially impact on development activities. Physical features of the environment are generally determined by oceanographic, meteorological, climatological, topographic, geophysical and hydrological processes, characteristics and interactions, in relation to the variability of natural systems (e.g., seasonal, inter-annual and synoptic oscillations). · Occupational hazards and safety in the workplace environment. · Supply of engineering media, raw materials, energy sources and waste treatment and assimilation systems (internally self-regulated within threshold limits). The study of adverse changes to these resources, from industrial development impacts, can be achieved by measurement of environmental quality, in conjunction the physical features (forcing functions) described above. This will be elaborated upon and further developed in subsequent posts. Ramjohn, Karl. 2000. Development of Methodology for Impact Detection and Monitoring in Accordance with The Certificate of Environmental Clearace Rules, Rule 10. M.Sc. Thesis, Science and Management of Tropical Environments. Faculty of Agriculture & Natural Sciences, University of the West Indies, St. Augustine, Trinidad & Tobago. September 2000; 117 pp. In a previous discussion on the characteristics, functions, and significance of “sustainable development” in the context of environmental management, it was noted that in order to attempt a rationalization of sustainable development (or achieving “sustainability” in development activities) and how that relates to the environment, it may be useful to establish a proper understanding of some of these main concepts. To begin with, what is the “environment” as it pertains to sustainable development? For this purpose, the “environment” can be considered as the combined features and assets that provide the basis for economic and social development, natural resource management and conservation. In this context, sustainable management strategies, options and “best design” practices must be planned and implemented in relation to the processes, components and attributes of abiotic (non-living), biotic and human factors in any given developmental landscape. Environment = The combined features and resource capital, that provide the basis for development, environmental management and conservation. Includes the processes and components of, and services provided by, atmospheric, hydrological, geophysical, biotic, human and landscape factors. Environmental quality = The status or value of the natural resource capital at a particular location at a specified time, relative to development, environmental management and conservation. Development = The act of altering and modifying resources in order to obtain potential benefits. Environmental Degradation = Adverse effects (reversible or permanent) on biophysical, social and economic resources, or any other reduction of the set of options available to future generations. Adverse Effects = Any reduction in environmental quality of a system, or other depletion of the environmental resource capital. Defined in terms of, and measured by, environmental impacts. From a policy, regulatory and legislative perspective, very closely related to implementation of all of these characteristics of sustainable development, is the “Precautionary Principle” – a sustainability principle which states that if there are threats of serious irreversible environmental impact, lack of full scientific certainty will not be used as a reason for postponing measures to prevent environmental degradation. This discussion, initiated just two months ago, has had the input of views and perspectives from about 10 different members of that forum, from a variety of nationalities and professional backgrounds, and as such, adds diversity to, and addresses some gaps in, the material covered in the earlier posts on this site. Any reduction in environmental quality of a system, or other depletion of the environmental resource capital. Defined in terms of, and measured by, environmental impacts. A possible course of action, in place of another, that would meet the same purpose and need (of the proposal). A subsurface geological rock formation that has a high-to-moderate permeability and can yield an economically significant amount of water. The variability among living organisms from all sources including inter alia, terrestrial, marine and other aquatic ecosystems. Generally considered at three levels: genetic, species and ecosystem diversity. Include genetic resources, organisms or parts thereof, populations or other biotic components of ecosystems, with actual or potential use for humanity (or other living organisms). Environmental processes, ecological functions and natural resource components (biological, physical and geochemical) not directly controlled by, or dependent upon, human activities. Progressive environmental degradation over time resulting from a range of activities throughout an area or region, each of which when considered in isolation may not be regarded as a significant contributor. The solution is better regional planning and control. Measure of the level of validity required for interpretation and decision-making. Depends on the accuracy of the analytical methodology used, and reliability of environmental data generated. Decibel (A-Scale): An international weighted scale of sound pressure levels or environmental noise, used to provide a good correlation with subjective impressions by individuals (in most cases, of loudness and sense of annoyance). The B, C and D scales are used for more specialized noise measurements. The act of altering and modifying resources in order to obtain potential benefits. Consist of a wide range of human activities which provide (a) favourable conditions for an increase in the transformation of the natural, biophysical environment to provide goods and services available to society and (b) actions which directly produce the goods and services. Occurs when development, which moves toward social and environmental sustainability, is financially feasible. Dynamic complex of human, plant, animal and micro-organism communities and associated abiotic (non-living) environment interacting as a functional unit. Ecosystem structure is defined by the interactions between abiotic factors and biotic components of the system. Functions are activities or actions which occur naturally as a product of the interactions between ecosystem structure and processes which, taken together with the functions of other ecosystems, collectively provide “services” upon which all life on earth depends, including maintaining the balance of atmospheric gases, recycling of nutrients, regulating climate, maintaining hydrological cycles, and creating soils. Aqueous or suspended particulate waste streams discharged to the environment as industrial facility process residues. Gaseous or aerosol waste streams discharged to the environment as industrial facility process residues. The combined features and resource capital, that provide the basis for development, environmental management and conservation. Includes the processes and components of, and services provided by, atmospheric, hydrological, geophysical, biotic, human and landscape factors. Raw facts about environmental quality. Obtained by analytical processes that convert environmental samples to numerical estimates (within error limits) of environmental quality characteristics. Adverse effects (reversible or permanent) on biophysical, social and economic resources, or any other reduction in the “set of options” available to future generations. Changes in environmental quality due to external disturbance to a system. Includes beneficial and adverse, primary and secondary, cumulative, synergistic, short, medium and long-term, reversible and irreversible. Described in terms of magnitude (of effect), direction (of change) and probability (of occurrence), with or without mitigation. Test and confirmation of environmental impact hypothesis. Formally stated, testable conjecture of predicted change in environmental quality associated with development actions. Can be defined in terms of environmental quality indicators, to facilitate testing (at appropriate levels of confidence). A system which provides a structured process for continual improvement and which enables an organization to achieve and systematically control the level of environmental performance that it sets itself. In general, this is based on a dynamic cyclical process of “plan, implement, check and review”. The status or value of the natural resource capital at a particular location at a specified time, relative to development, environmental management and conservation. Measurable parameters that describe environmental quality and related human actions, in a summarized format. Physical collection of a representative portion of the environment, using techniques which facilitate accurate generation of reliable data. Practices to ensure that the natural resource capital remains intact; i.e., that the source and sink functions of the environment should not be degraded. Therefore, the extraction of renewable resources should not exceed the rate at which they are renewed, and the absorptive capacity of the environment to assimilate wastes should not be exceeded. Furthermore, the extraction of non-renewable resources should be minimized and should not exceed agreed minimum strategic levels. Living space – all the elements which collectively define and constitute the locality or nature of the spatial and temporal “frame of reference” within the biosphere in which plants, animals and humans live. Includes non-living influences such as soil, light, temperature, moisture, humidity and other abiotic factors, as well as biotic (living) components which influence, or are influenced by, the activities of organisms, individuals, communities and organizations, all of which integratively determine the “quality of life” conditions. The physical, mental and social well-being of individuals or communities, and not merely the absence of disease or infirmity. The physical, social, and economic components, conditions and factors that interactively determine the state, condition, and quality of living conditions, employment, and health of those affected directly or indirectly by resource development activities in a given area. The risk level for a specific individual (e.g., potentially exposed personnel in facility). Measured in terms of probability that a particular individual will be exposed, injured or suffer other losses. Waters that flow over or rest upon the surface of the lithosphere, in the interior of a land mass, and in dry weather conditions, includes the area over which such waters are seasonally present. Includes rivers, streams, tidal waters, swamps, ponds and impounded reservoirs. An area of the earth’s surface, including all elements of the physical and biological environment that influence land use. Refers not only to soil, but also landforms, climate, hydrology, vegetation and fauna, together with land improvements such as terraces and drainage works. The temporary or permanent lowering of the productive capacity of the land, or its potential for environmental management. Includes air, water and soil pollution, loss of aquatic or soil bio-activity, increased surface run-off and erosion, bio-accumulation of toxic substances, soil fertility decline, salinisation, waterlogging, contamination or lowering of water table, increased surface albedo, and deforestation, forest degradation or other habitat loss. The condition of land relative to land use, including agriculture forestry, industry, conservation and environmental management. The management of land to meet specified socio-economic objectives. Land use is described by the purposes for which the land is used, and the types and sequences of development, conservation and environmental management activities carried out upon the land. The purposeful planning, design and implementation of decisions, activities, engineering solutions or management systems that are intended to reduce the undesirable impacts of proposed development actions on the affected environment. Products generated by ecosystems include: forest resources, wildlife resources, forage resources, fisheries, agricultural resources and water supply, and represent the good and services generated by the interactions between the biological, chemical and physical components of an ecosystem. Attributes of an ecosystem include biological diversity and unique landscape, heritage and cultural features, which may lead to certain uses or the derivation of particular products, but they may also have intrinsic, unquantifiable importance. Sound pressure emissions of sufficient magnitude, intensity or continuity to be regarded as a form of pollution. Unlike chemical pollutants, noise emissions dissipate relatively rapidly over distance and time and can be regarded as a localized environmental problem. Discernable, confined and discrete conveyance source, including (but not limited to) any pipe, ditch, channel, conduit, well, discrete fissure, container, drilling rig, oil and gas platform, vent or vehicle, from which pollutants can potentially be discharged to the environment. The release of any material, surplus energy or other waste stream into the environment in sufficient quantities to exceed thresholds, and adversely affect environmental quality in the short, medium or long-term. Sustainability principle which states that if there are threats of serious irreversible environmental damage, lack of full scientific certainty will not be used as a reason for postponing measures to prevent environmental degradation. Organisation (private or public sector) or individual seeking environmental clearance for implementation of development proposal. Socio-economic environmental concept embracing a diversity of values not always recognized, or adequately addressed, in marketplace analysis. Includes factors such as real income, housing, working conditions, health, educational services and recreational opportunities, which may be regarded as the general standard of living. Technique used to determine the likelihood or chance of hazardous events occurring and the likely consequences. Originally developed for nuclear and chemical industry, where low probability events potentially have extremely serious results. Probabilistic risk analysis can be used to characterise environmental impacts, whose occurrence and nature are difficult to predict with any degree of accuracy. The component of precipitation or irrigation water that flows from the land-surface into streams or other surface-water. Run-off can transport pollutants from the air and soil into surface water. Flooding occurs when surface run-off exceeds stream channel capacities. A procedure for narrowing the scope of an assessment and ensuring that the assessment remains focussed on the truly significant issues or impacts. The component of EIA concerned with changes in the structure and functioning of social orderings. In particular, the changes that a development would create in: social relationships; community (population, structure, stability, etc); quality and way of life; language; ritual; political/economic processes; attitudes/values; health impacts. Practices to ensure that the cohesion of society and its ability to work towards common goals are maintained. Individual needs such as those for health and well-being, nutrition, shelter, education and cultural expression should be met. Individuals or entities potentially affected by development proposal, e.g., local populations, government agencies, developers, workforce, customers and consumers, and others. Value or state of an environmental variable, considered to be desirable to achieve, and undesirable or illegal to exceed. Standards can act as either as targets (ambient characteristics for specified uses) or limits (quantities of potential pollutants released to environment), which should not be transgressed. Circumstances in which (by acting together) separate elements (e.g., environmental pollutants) produce a greater effect than would be produced if they acted separately. Critical value or state of a variable (e.g. ecological resilience) beyond which rapid, often exponential, negative changes to environmental quality occur. Beyond threshold levels, changes are frequently irreversible or very slowly reversible. 1. Ramjohn, Karl. 2000. Development of Methodology for Impact Detection and Monitoring in Accordance with The Certificate of Environmental Clearace Rules, Rule 10. M.Sc. Thesis, Science and Management of Tropical Environments. Faculty of Agriculture & Natural Sciences, University of the West Indies, St. Augustine, Trinidad & Tobago. September 2000; 117 pp. 2. DEAT 2000. Guideline Document: Strategic Environmental Assessment in South Africa. Department of Environmental Affairs and Tourism, Pretoria, Republic of South Africa. May 2000; 36 pp. 3. EMA 1999. Trinidad & Tobago: State of the Environment 1998 Report. Environmental Management Authority, Republic of Trinidad & Tobago; 66 pp. 4. Glowka, L., Burhenne-Guilmin, F. & Synge, H. 1994. A Guide to the Convention on Biological Diversity. IUCN Policy & Law Paper, No. 30; 161 pp. 6. Bisset, R. 1996. Environmental Impact Assessment: Issues, Trends and Practice. Environment & Economics Unit, United Nations Environment Program. June 1996; 96 pp. 7. Gilbert, R., Stevenson, R., Girardet, H. & Stren, R. 1996. Making Cities Work. Earthscan Publication Limited, United Kingdom. 8. Interorganizational Committee on Guidelines and Principles for Social Impact Assessment 1994. Guidelines and Principles for Social Impact Assessment. US Department of Commerce / National Oceanic and Atmospheric Administration / National Marine Fisheries Service. May 1994; 33 pp. 9. Pieri, C., Dumanski, J., Hamblin, A. & Young, A. 1995. Land Quality Indicators. World Bank Discussion Paper No. 315. The World Bank, Washington, DC; 63 pp. 10. TTBS 1998. Specification for the Effluent from Industrial Processes Discharged to the Environment. TTS 547:1998. Trinidad & Tobago Bureau of Standards. Goal: Ideal or desirable value or state of environmental quality, identified by scientists and policy makers. Target: Value or state of environmental quality considered to be attainable in the short or medium term (in the interest of long-term environmental management goals). From this perspective, the goal of environmental management is to promote national development in the various sectors, in an economically viable and socially acceptable manner, without causing environmental degradation. This long-term goal may be approached by establishing targets, to be attained in the short to medium-term. In the context of environmental management, the primary target of all proposed developments, is to promote a favourable cost-benefit ratio, by undertaking tangible accounting of goods, services and attributes of the natural resource capital. One of the major challenges to implementation of sustainable development legislation in developing countries is that frequently, where feasible engineering solutions (or other techniques) exist for ecological compatibility, concern of a loss of economic efficiency are cited as a perceived outcome (e.g., the so-called “environment vs jobs” trade-off). There are also frequent socio-cultural barriers to effective implementation. These factors may directly affect the functional application of environmental laws, by hindering the establishment of progressive trade-offs among the three main objectives of sustainable development . Consequently, they may also complicated attempts to integrate environmental concerns into conventional economic decision-making. The economic approach to sustainability is based on the Hicks–Lindahl concept of the maximum flow of income that could be generated while at least maintaining a stock of assets (or capital) which can yield these benefits. There is an underlying concept of optimality and economic efficiency applied to the use of scarce resources. Problems of interpretation arise in identifying the kinds of capital that need to be maintained (e.g., manufactured, natural and human capital) and their substitutability, as well as in valuing these assets, particularly ecological resources. The issues of uncertainty, irreversibility and catastrophic collapse pose additional difficulties. The social (or socio-cultural) concept of sustainability seeks to maintain the stability of social and cultural systems, including the reduction of destructive conflicts. Both intragenerational equity (especially elimination of poverty) and intergenerational equity (involving the rights of future generations) are important aspects of this approach. This approach attempts the preservation of cultural diversity across the globe, and better use of knowledge concerning sustainable practices embedded in less dominant cultures. Modern society would need to encourage and harness pluralism and grass-roots participation into a more effective decision-making framework for sustainable development. The ecological view of sustainable development focuses on the stability of biological and physical systems. Of particular importance is the viability of biological and physical systems that are critical to the overall ecosystem. Protection of biodiversity is a key aspect. Furthermore, “natural” ecosystems may be interpreted to include all aspects of the biosphere including man-made environments like cities and industrial estates. The emphasis is on preserving the resilience and dynamic ability of such systems to adapt to change, rather than conservation of some “ideal” static state of the environment. Evaluation of these objectives using direct monetary comparisons may not always provide adequate accounting of the natural resource capital in relation to environmental degradation. In this context, the efficient application of the Environmental Impact Assessment (EIA) process may require the implementation of multi-criteria analysis (Munasinghe, 1993). Subsequent posts will discuss inter alia the use of indicators of environmental quality in providing a scientific basis for assessing costs and benefits, to assist in addressing the economic, social and ecological concerns associated with the implementation of sustainable land use and enforcement of impact control legislation. Munasinghe, Mohan. 1993. Environmental Economics and Sustainable Development. World Bank Environmental Paper No. 3. The World Bank, Washington DC, USA. Ramjohn, Karl. 1999. Sustainable Solutions to Land Degradation (Saline Intrusion) in the Lower South Oropouche Floodplain: Community-based Management Strategy. Tropical Environment Research & Management Center, Trinidad & Tobago. May 1999; 22 pp. If you are the owner of SUSTAINABLE LAND USE & IMPACT ASSESSMENT, or someone who enjoys this blog why not upgrade it to a Featured Listing or Permanent Listing?